With the launch of the Warner Archive series of burn to order or digital download catalog releases, Warner has been pretty quiet on the pressed disc catalog DVD front for the last several months. Fortunately, they have not completely given up the idea as this latest entry in the "TCM Spotlight" series illustrates. 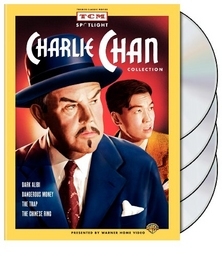 For the Charlie Chan Collection, Warner mines its Monogram Studio archives for four new to DVD postwar entries from the Charlie Chan film series. In Dark Alibi, Charlie Chan (Toler) is drawn into the case of an ex-con who is set to be executed in two days out of sympathy for his daughter June (Loring) who never knew of his criminal past. He has his work cut out for him as the man's fingerprints were found at the scene of the robbery-homicide for which he was convicted, and he must sort through an entire boarding house full of suspects. With the help of valet Birmingham Brown (Moreland) and "Number Three Son" Tommy (Fong), he soon suspects a larger conspiracy reaching within the very prison walls where June’s father awaits his execution. In Dangerous Money, a cruise to Samoa takes a turn for the mysterious when a treasury agent is killed. The ship is filled to the brim with potential suspects and the presence of esteemed detective Charlie Chan's (Toland) on-board makes them extra cautious about concealing the secrets behind their suspicious behavior. While the efforts of "Number Two Son" Jimmy (Young) and valet Chatanooga Brown (Best) to impress Chan prove amusingly counterproductive, Chan still manages to unravel a complex mystery involving forged currencies, misappropriated art, a novel method of throwing daggers, and even some gender confusion! In The Trap, Charlie Chan is called to a beach house full of showgirls when one of their own winds up murdered and the hated lead actress has disappeared. Chan is assisted in his efforts by valet Birmingham Brown (Moreland) and "Number Two Son" Jimmy (Young). The usual complex conspiracy leads them down a number of blind alleys and towards an assortment of red herrings with checkered pasts before the real killer can be flushed out. Solving a homicide or two does not slow Jimmy down from pursuing a romance with showgirl/suspect San Toy (Wong). In The Chinese Ring, Charlie Chan (Winters) takes on a case that literally hits close to home when a Chinese princess is assassinated in the drawing room of his house. In addition to his usual sidekicks of valet Birmingham Brown (Moreland) and Number Two Son (whose name has inexplicably been changed to) Tommy (Young), Chan works with local Police Sergeant Bill Davison (Douglas) and feisty reporter Peggy Cartwright (Currie) to unravel the mystery. The trail of evidence eventually leads to some suspicious dealings involving attempts to defraud business partners in an illegal airplane purchase scam, although the killer's role in this conspiracy remains cloudy until the very end. While to modern audiences, the idea of an Anglo actor playing an Asian character will seem a bit off-putting, the Charlie Chan series of films had been a dependable moneymaker for Fox and Monogram Studios in both domestic and international markets in the 1930s and 1940s. (Perhaps to stave off proponents of applying modern political correctness standards to vintage films, the press materials for this DVD set point out that the series was the most popular American film series in China in the 1930s). Fox produced sixteen films starring Warner Oland in the role through 1937 and, after Oland's death, eleven more with Sidney Toler in the role from 1938 through 1942. Toler was able to revive the series at the lower budgeted Monogram Studios beginning in 1944 and made another eleven films until his death in early 1947. Monogram continued the series with six more films starring Roland Winters as Chan before ending production in 1949. This release from the Monogram vaults collects three of the last four films starring Toler from 1946 and the debut appearance of Winters in the role from 1947. Toler was suffering from cancer during the productions of Dangerous Money and The Trap, but insisted on pressing on in the role. For these two films (and Shadows over Chinatown produced immediately prior to them but not included in this collection), Monogram reunited Toler with Victor Sen Young, who reprised his role of "Number Two Son" Jimmy from the Fox years. Possibly to reduce the burden on Toler, Young was given a lot of screen time involving comic bits of business with Mantan Moreland and Willie Best and even a romantic interest in The Trap. By far the best of these films is Dark Alibi which features an intriguing plot, develops its secondary characters enought that the audience can keep track of them, sneaks the inevitable twist into the ending without it feeling like a "cheat", and even allows Mantan Moreland to engage with his former Vaudeville partner Ben Carter in their stage-honed routine of conversations consisting entirely of incomplete sentences. As often as Moreland was relegated to trading in stereotypes with his characterization of Birmingham Brown, it is great to see him given a chance to unleash his considerable comic talent for wordplay on screen. Dangerous Money is not nearly as solidly plotted as Dark Alibi, but there is something almost surreal about the crazy bordering on nonsensical complexity of its plot. The comedy bits with Victor Sen Young as Jimmy and Willie Best as Chatanooga trying to make headway on the case to impress Chan fall flat and are almost painful to watch, beginning with their super non-PC walkie talkie handles of "Chop Suey" and "Pork Chop" and ending with some random physical comedy that is poorly set-up and executed. Fortunately, the breakneck pace of the rest of the film prevents one from dwelling too much on those failures. By the end of the film and with the benefit of rewinding, I think I finally figured out who the guy bound and gagged in the last reel was and how he got that way, but I'll be darned if I can figure out the explanation for the turtle with the flashlight attached to his back. The final two films are fairly weak entries in the series, with The Trap suffering from the effects of Toler's ill health, keeping him off screen for much of the film while moving the dull characters through a turgidly paced plot to an unsatisfying and abrupt conclusion. They had me at "beach house full of show girls" from the get go and then somehow still managed to lose me over the ensuing 68 minutes. Audiences having to adjust to the idea of Roland Winters as Charlie Chan in The Chinese Ring were not helped in any way by the terrible screenplay. The story itself is more rigidly structured and easy to follow than many of the Monogram entries in the series, and it is directed with a few more technical flourishes than its predecessors, but the whole enterprise is done in by some terrible dialog and bad acting. Winters is not responsible for my bad acting complaint, but he is hamstrung by some of the worst dialog. Many of the various Charlie Chan simile-filled aphorisms that became a signature of the series make zero sense in the context in which they are used, and, worse yet, the witty put-downs of Tommy (played inexplicably by Young who was previously "Jimmy") and Birmingham that were Toler's trademark are replaced by insults delivered without a trace of wit or affection. All titles are presented in black and white 4:3 video appropriate for their original theatrical presentations. For the most part, they exceeded my expectations with an appropriate range of contrast with mild fluctuations in density. Grain is significant, but not overwhelming, and is rendered very accurately by standard definition mpeg-2 compression standards. The video has not received the level of digital "touch-up" applied to some of the top-end Warner catalog titles, so there are some significant artifacts that appear from time to time. One of the more extreme examples of this are some diagonal negative scratches that last for several seconds during the scene in "The Trap" where Jimmy first shows up at the beach house. I am not sure what the failure mode would be that would cause a film element running vertically to be scratched diagonally for muliple frames. Other than that, artifacts include a mild assortment of brief scratches and light speckling as well as occasional softness and increased grain from the "dupes" used for optical titles and fades. All films are presented with English Dolby Digital 1.0 mono tracks. These tracks have also received less digital processing than some of the higher profile catalog releases from Warner, but in this case, I think it is a net plus. Background hiss and crackle are a bit higher than they could have been, but the overall audio track exhibits a more natural fidelity as a result. There are rare but noticeable pops and drop-outs in the source elements, and critical listeners will occasionally be able to hear the overall character of the background noise change when faders are lifted. The latter sounds like an actual production artifact rather than a post-production application of a noise gate to my ears. There are no extras present on this collection. The discs are assembled in a four panel digipack with plastic trays on each of the panels that hold a single DVD-5 disc for each film. The digipack itself slides into a reasonably sturdy cardboard slipcover. Disc menus do not include scene selection access, but the films are encoded with a handful of chapter stops each. The release of the TCM Spotlight: Charlie Chan Collection proves that while the pulse may be faint, there are still some signs of life in Warner's pressed disc catalog DVD program. It compiles four postwar Charlie Chan films from Monogram studios including both the final Sidney Toler appearance and the debut Roland Winters appearance in the role. The film series had largely run out of steam by this point, and its reliance on racial stereotypes will be like nails on a chalkboard to many modern viewers, but there is still some fun to be had, particularly in the relatively tightly plotted Dark Alibi and the surreally complex Dangerous Money. They are presented on DVD with acceptable transfers representing relatively low generation source elements warts and all, very good mono sound tracks, deluxe digipack packaging and no extras.